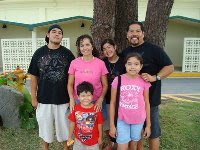 Pastor Rick Nagura and Kelly (the Slater) Scofield are here from Hawaii for a few days. We will give them some Okinawn. hospitality (Feed them Good). We are blessed to have them with us. It is also good to have Justin back! We know this man! This is Chaplain Dennis. He has been stationed here in Okinawa a few times. A good man, Praise The Lord! Oh our little sister is growing up. It was such a blessing seeing her at the afternoon service. She was not able to go to dinner with us but it was do good seeing her. God bless you sister! We had a few minutes so on the way back to Incheon Airport we stopped by to say hi. The kids at Daniel's school are adorable! He works at a cool place. It was good hanging out with our brother. Dean Pera is with us! Yes! Our brother cane all the way from Cheonan to visit us and we are blessed! Thank you Dean for coming all the way, it was fun chillin with you. Pastor Cisco, why are you doing us wrong? Just kidding! But seriously, this is a big one! It is already a category 5, the highest ranked, but it is scheduled to weaken (Please pray). It is not projected to hit Japan head on, please pray that it keeps turning away! God bless you all. We are finished in the field. The team had to turn over the rice stalks so that they could dry. One side was dry but the other side needs to dry in order for them to use the stalks for cooking. Nothing goes to waste on the farm. Afterwards some of the group washed Sweet potatoes, some others were pulling weeks from the grass. Afterwards we led worship for the House of Hope residents. This was a cool pict. W2ministries. I like that ring to it. Cool building! Actually this is the University building where Nayeon (Daniel's Wife Graduated) she is a music major from this College. The last leg of the trip heading to Korea. AirAsia all the way! We are looking forward to a great time in Korea. All for the Glory of God! Shining Jesus! Please pray for us! Thank you for your prayers! I got up this morning. The report was that they were canceling flights into Tokyo. We need to fly out today, drop off our bags in Tokyo in order to catch our flight the next day to Korea. In my morning devotion I asked The Lord "Are we flying out today?" The Lord said this specifically "Today I will fly you out by My Grace, trust Me". I was working out and it was stormy still. Wind howling, I was thinking "Are you sure Lord?" We are flying out in 30 minutes. To God be ALL the Glory! We were blessed Friday with Pastor Masaru teaching at our lectures in ministry class here at CCBCJAPAN. Like always he did an excellent job! Thank you brother so much. To God be All the Glory! Please pray for us. We know that God will take care of us, but please pray for the safety of the island. It is going to be a big one, but The Lord can "calm it down". Thank you for your intercessory prayer. To God be the Glory! It is Birthday time at the Koinonia Cafe. Only two birthday this month (Very Unusual). Happy Birthday Boys! The winds were strong the rain was deep but it is over now. Getting ready for Church tomorrow. Praise The Lord! Now we will prepare for the next one which will hit us Tuesday afternoon. Please continue to keep us in your prayers. God blessed us and there was no damage.